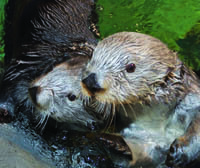 Animal Helpers: Aquariums by Jennifer Keats Curtis is one of the newest spring titles from Arbordale Publishing (formerly Sylvan Dell). This photojournal style book and it's accompanying activities on the Arbordale website combine to create an interesting unit study on oceanography and conservation. The free downloads include enrichment activities in science, geography, language arts, and reading, and the book itself is a wonderful introduction to careers in marine science. 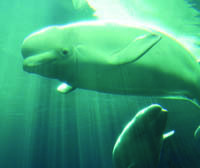 Animal Helpers: Aquariums shows how aquarium staff teach about ocean and freshwater creatures and work to conserve and protect endangered animals. Like a field trip, this book takes readers behind the scenes at the Florida, Georgia, Monterey Bay, National, Shedd, and Tennessee aquariums. The vibrant photographs give readers an up close view of things like jellyfish, penguins, seahorses, alligators, and fishes. 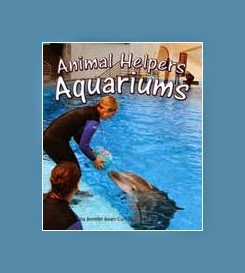 If you don't have an opportunity to visit an aquarium in real life, this book is the next best thing. Student activities in the "For Creative Minds" section get kids thinking about careers they might not have ever heard of, such as herpetology and aviculture. Landlocked students also get exposed to animal life they might never see otherwise, and the engaging style of the book's layout is appealing for all ages. As a read aloud, the pictures hold kids' attention while listening to facts in this nonfiction book. The text is easy to read for even early readers, but the subject matter is universal, so older reluctant readers will not feel they are reading a "babyish" book with Animal Helpers.